The yield curve, the difference between interest rates on short-term and long-term government bonds, has warned of recessions before with surprising accuracy, and it’s become a big topic on Wall Street. You can try to play down a trade war with China. You can brush off the impact of rising oil prices on corporate earnings. But if you’re in the business of making economic predictions, it has become very difficult to disregard an important signal from the bond market. The so-called yield curve is perilously close to predicting a recession — something it has done before with surprising accuracy — and it’s become a big topic on Wall Street. Terms like “yield curve” can be mind-numbing if you’re not a bond trader, but the mechanics, practical impact and psychology of it are fairly straightforward. Here’s what the fuss is all about. The yield curve is basically the difference between interest rates on short-term U.S. government bonds, like two-year Treasury notes, and long-term government bonds, like 10-year Treasury notes. 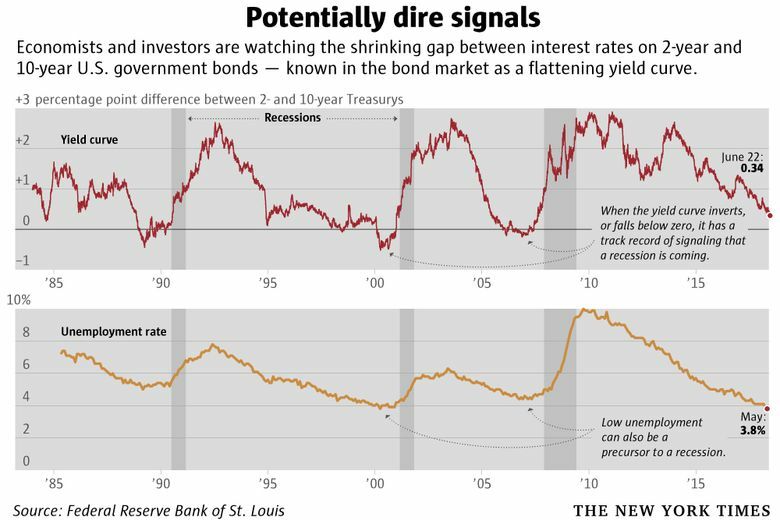 At the same time, the Federal Reserve has been raising short-term rates, so the yield curve has been “flattening.” In other words, the gap between short-term interest rates and long-term rates is shrinking. On Thursday, the gap between two-year and 10-year U.S. Treasury notes was roughly 0.34 percentage points. It was last at these levels in 2007 when the U.S. economy was heading into what was arguably the worst recession in almost 80 years. As scary as references to the financial crisis makes things sound, flattening alone does not mean that the United States is doomed to slip into another recession. But if it keeps moving in this direction, eventually long-term interest rates will fall below short-term rates. When that happens, the yield curve has “inverted.” An inversion is seen as “a powerful signal of recessions,” as New York Fed President John Williams said this year, and that’s what everyone is watching for. Every recession of the past 60 years has been preceded by an inverted yield curve, according to research from the San Francisco Fed. Curve inversions have “correctly signaled all nine recessions since 1955 and had only one false positive, in the mid-1960s, when an inversion was followed by an economic slowdown but not an official recession,” the bank’s researchers wrote in March. Even if it hasn’t happened yet, the move in that direction has Wall Street’s attention. Sure, it seems like a strange time to be worried about recession. Unemployment is at an 18-year low, corporate investment is picking up steam and consumer spending shows signs of rebounding. Some economists on Wall Street think the economy could be growing at around a nearly 5 percent annualized clip this quarter. But if the current economic vigor is only reflecting a short-term stimulus coming from the Trump administration’s tax cut, then some kind of slowdown is to be expected. “It’s very hard to see what’s going to goose the economy further from these levels,” Gibbs said. And the financial markets can sometimes sniff out problems with the economy before they show up in the official economic snapshots published on gross domestic product and unemployment. Another notable yield-curve inversion occurred in February 2000, just before the stock market’s dot-com bubble burst. In that sense, the government bond market isn’t alone. Stocks have been in a sideways struggle since the S&P 500 last peaked Jan. 26. Returns on corporate bonds are negative, as are some key commodities tied to industrial activity.